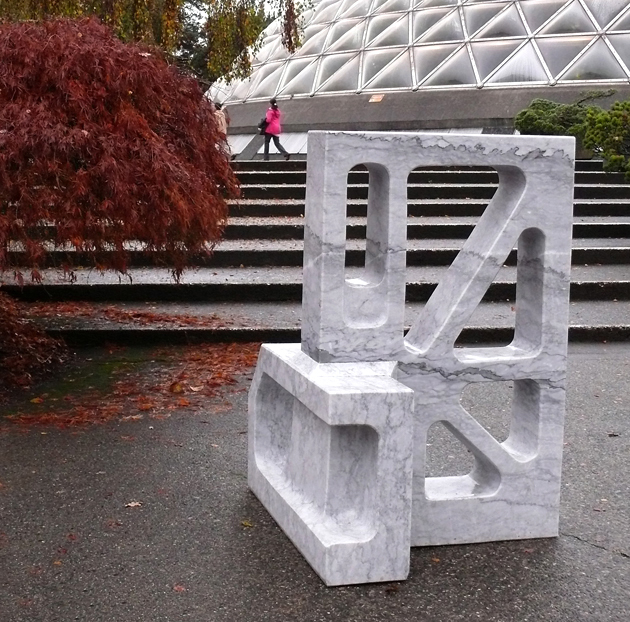 New Sculptures Outside the Bloedel Conservatory! 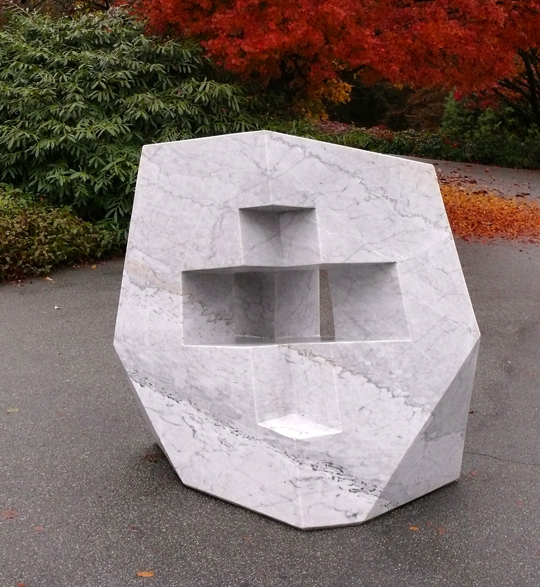 Four new marble and granite sculptures by artist Cameron Kerr of Campbell River, have been installed at Queen Elizabeth Park plaza in front of the Bloedel Conservatory. 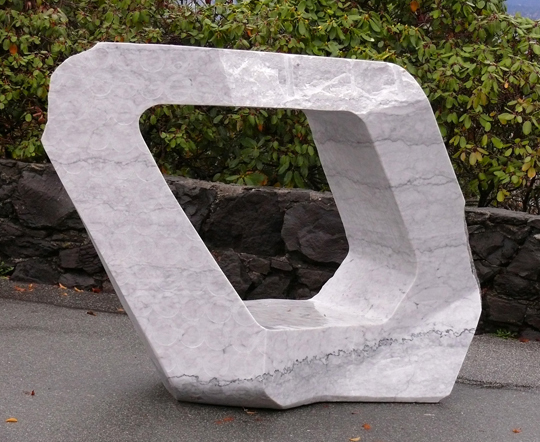 The sculptures, inspired by modernist architecture, are beautifully carved, while the raw stone influenced the direction the pieces took during the sculpting process. Kerr attended the Academy of Fine Arts in Carrara, Italy and took Master Classes with modernist British sculptors William Tucker and Anthony Gormley, Gormley being best known for the public sculpture ‘Angel of the North’ in the North of England. Mr. Kerr is a graduate of the Emily Carr Institute of Art and Design. The sculptures, each weighing between 2,500 to 5,000 pounds apiece, were transferred from the Queen Elizabeth Theatre plaza to Bloedel Conservatory viewing deck last weekend. The artwork was originally commissioned by the City Public Art Program to mark the Vancouver’s 125th anniversary. 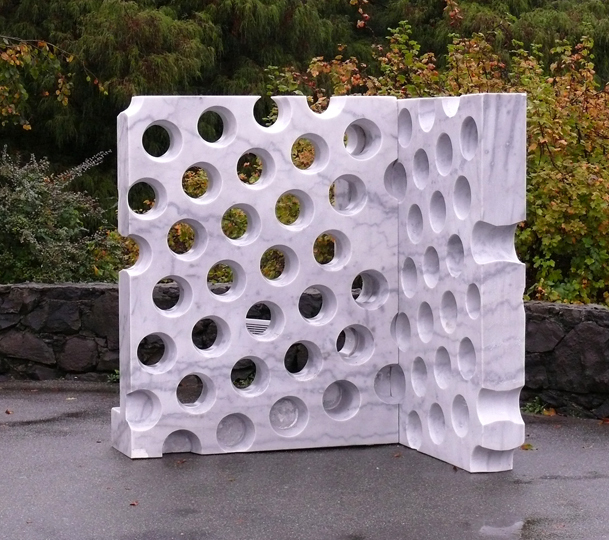 These sculptures are currently a temporary installation, but could become permanent artwork in Queen Elizabeth Park with approval from the Vancouver Board of Parks and Recreation. 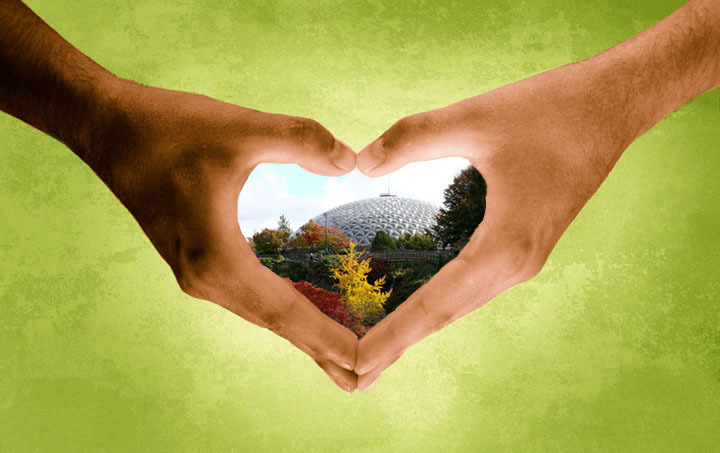 Happy 42nd Anniversary Bloedel Conservatory! 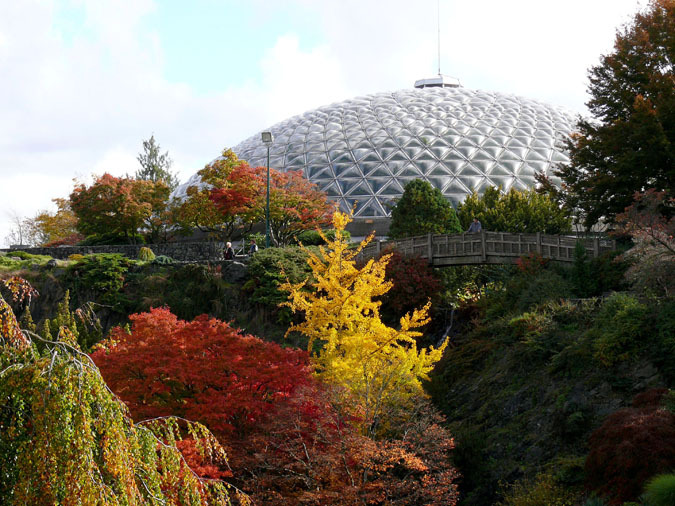 The Bloedel Conservatory opened December 6th, 1969 and was the first domed floral conservatory in Canada! 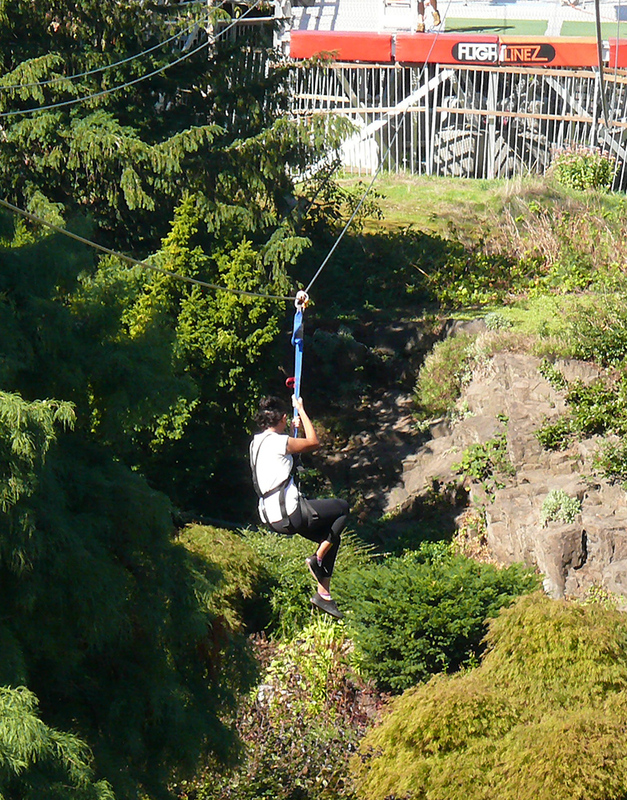 It is at the geographic centre of Vancouver at its highest point in Queen Elizabeth Park. We thought you might like to read about the history of this fantastic green jewel at the top of our city on this special Anniversary day! 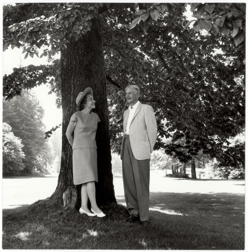 In 1966, while Canada prepared for its Centennial celebrations, two men in Vancouver had a grand vision. 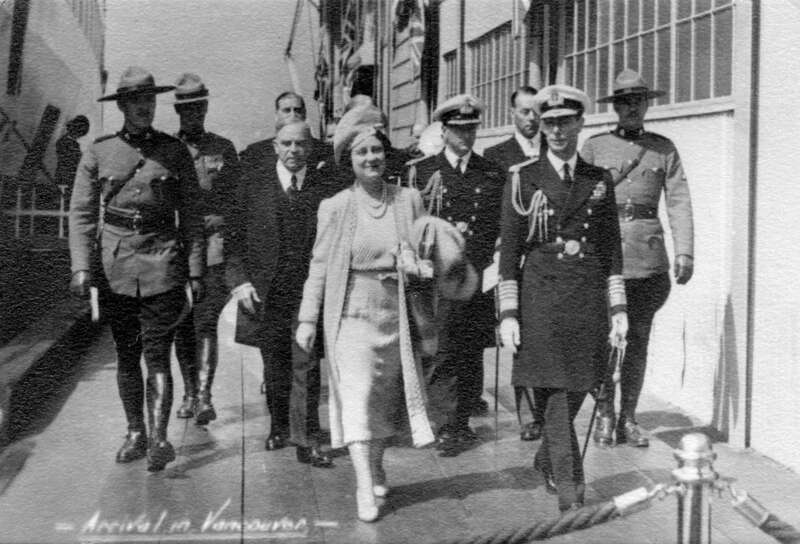 Stuart Lefeaux, Superintendent of the Vancouver Board of Parks and Recreation, and Deputy Superintendent Bill Livingstone wanted to something that would enhance the image of Vancouver and give people something to be really excited about! Their vision was to build a Conservatory for exotic plants that would not only be educational, but would also be a beautiful place to visit. Where better to build such a structure than the geographic centre of the city and at its highest point of land? Queen Elizabeth Park was the obvious answer. But now how to pay for it? Stuart and Bill knew there must be a philanthropist in the city who would like their name attached to such a project. They approached Prentice Bloedel, retired Vice Chairman of the Macmillan Bloedel Lumber Company. Prentice, a visionary in his own right, teacher at heart and a pioneer in the areas of recycling and the human/ environmental connection agreed! 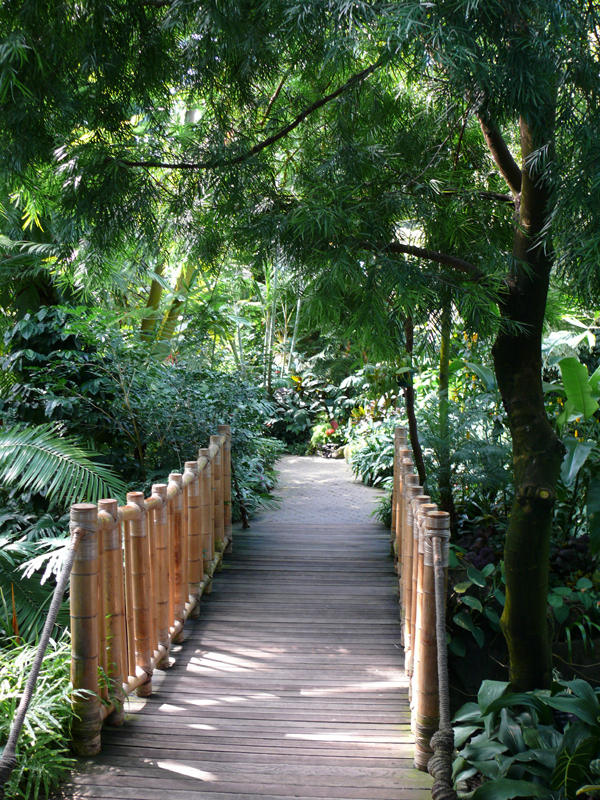 The Bloedel Foundation put forward $1.4 million dollars (worth $8.6 million in 2012 dollars) in conjunction with contributions by the City of Vancouver and the Provincial Government to build the Bloedel Conservatory, the fountains and the surrounding plaza. This was the largest civic gift given to Vancouver to date. 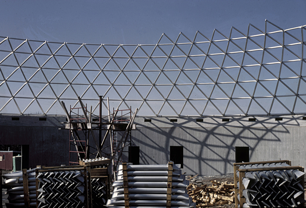 Construction of the aluminum framing of the Bloedel Conservatory. 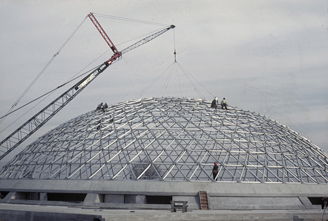 The elements for the triodetic dome frame were manufactured in Ottawa and shipped 3,000 miles across the country to Queen Elizabeth Park. Once it arrived, the aluminum framework was erected in just 10 days although the entire Conservatory structure took over 1 year to complete. The Grand Opening of the Conservatory took place on December 6, 1969 and hosted over 500,000 people in its first year of operation. 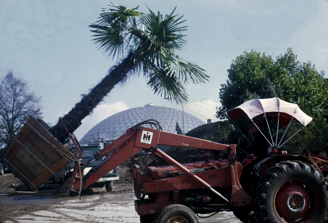 Bringing in the palms at the Bloedel Conservatory, 1969. The Bloedel Conservatory is significant for its historical, symbolic, cultural, and social values, and particularly for its use of technologies and building methods which were quite advanced for its time. The Conservatory, the fountain and the surrounding plaza were all designed to work together and with specific goals to show man’s connection to nature. The curving lines of the fountain harmonize with the Conservatory dome, while the leaping fountains add vertical movement to mirror distant trees. The dome structure with its absence of interior supporting columns was chosen to provide an unobstructed view of the exotic gardens within. 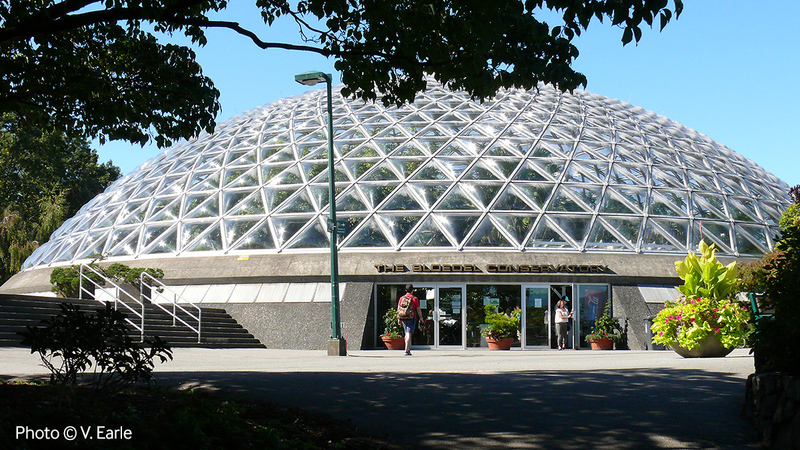 The Bloedel Conservatory won the prestigious Vincent Massey Award for Excellence in Urban Environment in 1971 and is listed on the Canadian Register of Historic Places. Join us for the Jewel Box of Lights Opening Event, this Friday, December 9th between 6 and 9pm to help us celebrate this amazing tropical oasis! A great time is sure to be had by all! 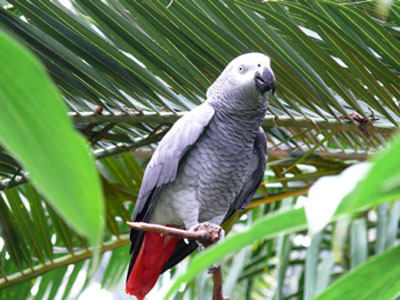 It’s easy to recognize the larger parrots at the Bloedel Conservatory, but the smaller free-flying birds are a bit harder to name. Some of these little guys only show themselves occasionally, so it has been tricky getting portraits of them all. This post will be updated frequently as more photos are collected. If you can spot every bird on this list, you are fortunate indeed! Enjoy! Leave us a comment and let us know which birds are your favorites! 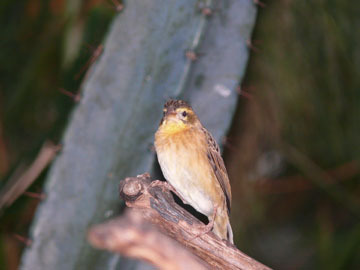 The Napoleon Weaver is native to south central Africa. They build their nests by anchoring vertical palm fronds to a branch and then weaving horizontal palm leaf strips in and out of that structure. If you look carefully around the Conservatory in the Spring and late fall (November), you might see one building one of these intricate nests. They are slightly more yellowish than the Orange Bishop Weaver finch. 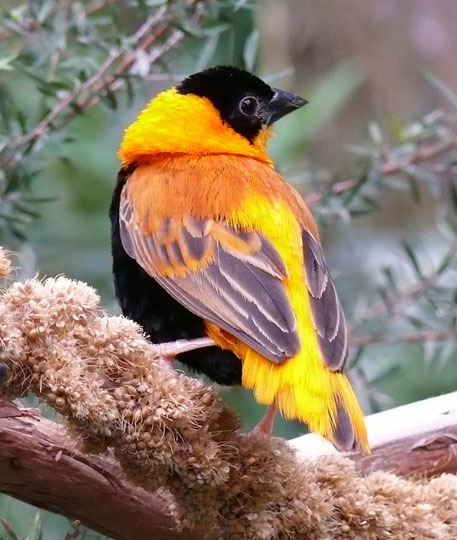 The Orange Bishop Weaver is VERY similar to the Napoleon Weaver. The easiest way to tell the males apart is by their tail and forehead colour. The Orange Bishop has a black face AND forehead, while the Napoleon Weaver tends to only have black cheeks. The Orange Bishop is also a deeper orange with an orange tail. 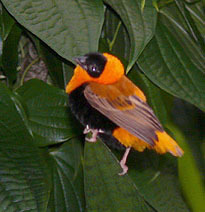 The Orange Bishop Weaver builds a hanging globe for a nest. The females will inspect all the nests and select the best architect as a mate. When you see them carrying strips of palm fronds, you know it’s nesting season. 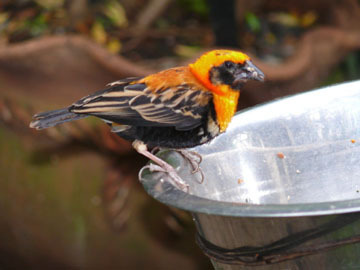 Orange Bishop finches are native to the grasslands of east Africa. 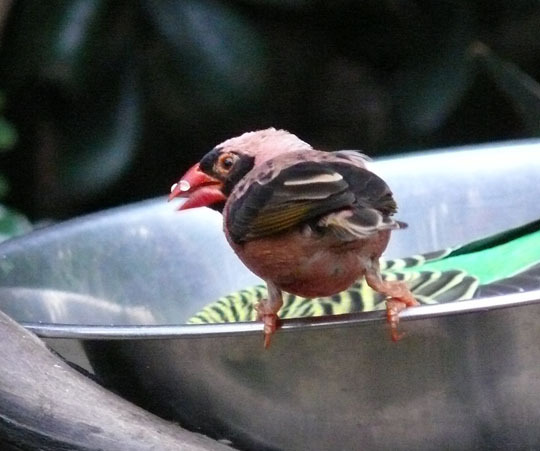 These adorable little finches love to eat often throughout the day and can usually be spotted at the feeding station in the Subtropical area of the Conservatory. These little guys have ‘fawn’ spots on their wings and unmistakable orange cheeks. Zebra finches eat seeds and are just over 3 1/2 inches in length. They are native to Australia and are very good singers. 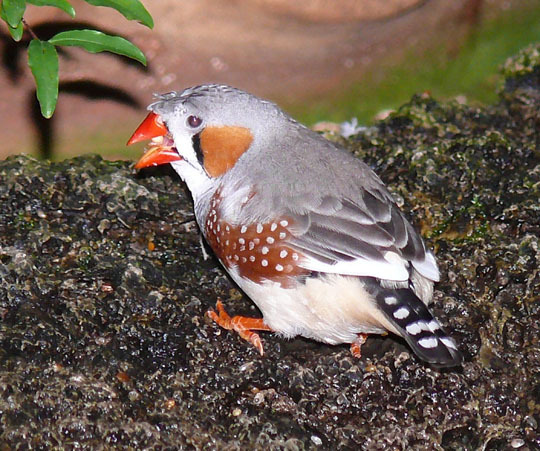 In fact, an interesting study at McGill University studied the complexity of the song of the male Zebra finches. The research found that the little guys with the most intricate song were also better foragers for food – making them a better ‘catch’ for the ladies! The Japanese White Eyes, also called Mejiros, are extraordinary song birds. The name White-eye was given because of the silky white rings around the eyes. They are native to Japan, but today can be found across Korea, India, Pakistan, Ceylon, Burma, and the Philippines. 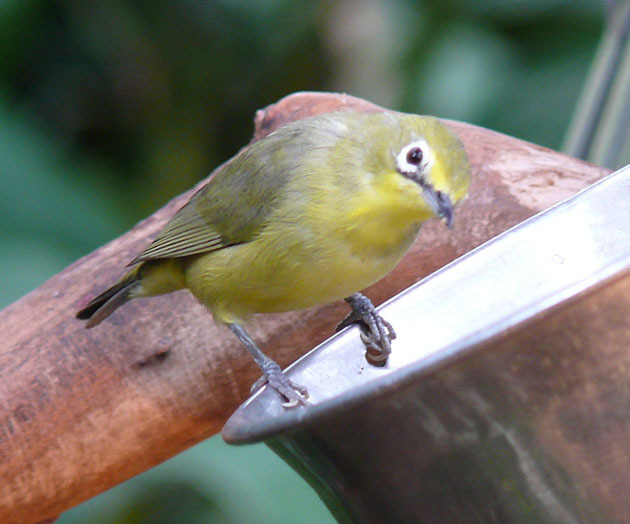 Japanese White Eyes were introduced to Oahu in 1929 and can now also be found throughout all the Hawaiian Islands. 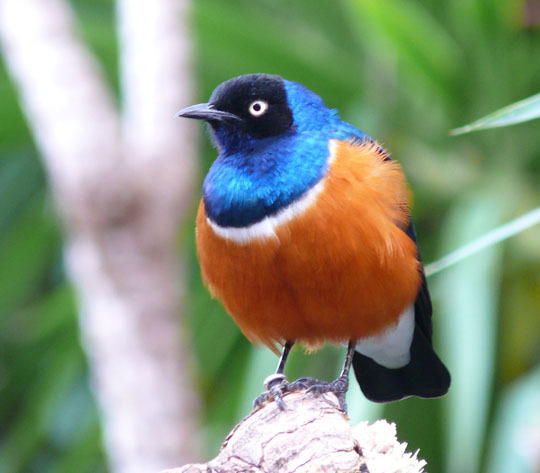 These little birds tend to eat insects, but fruit is their favorite food. They are easily tamable and quite sociable. Along with their beautiful songs, this makes the Japanese White Eye a favorite household companion. 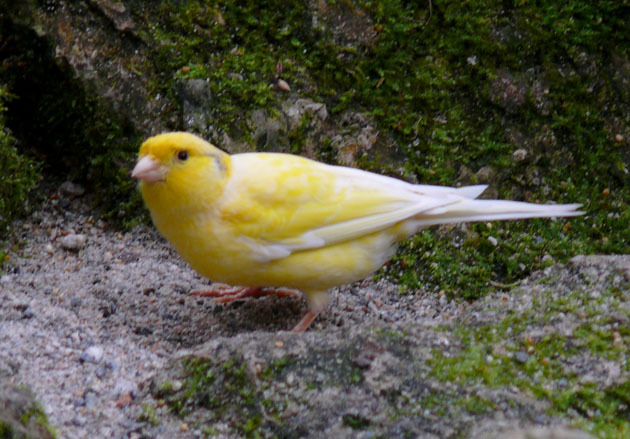 Canaries are actually part of of the finch family, but they are far less social. And yep, you guessed it, they are native to the Canary Islands. There are a number of colour mutations that have appeared over the years including bronze, white and red. Did you know that only male canaries sing and are very territorial? This is the only way you can tell them apart from females! The Strawberry Finch is also known as the Red Avadavat or Red Munia. This is the only finch where males go out of colour when not breeding. During breeding season they become bright red with small white spots showing up along the neck, breast and sides … very much like a strawberry! They can be found throughout India and Asia in the wild. These birds are native to southwest China and northwest Vietnam and are part of the Old World babbler family (Timaliidae). Laughing thrushes are approx 10 inches long (27 cm) and tend to travel in pairs or small groups close to the forest floor. Look for them smoothly hopping though the low ‘under growth’ at the Conservatory. They can be quite ‘talkative’ in the late afternoons, making loud whistling songs. These beautiful birds have deep metallic blues, purples and greens in their plumage. This bright colouring is due to iridescence which is actually derived from the structure of the feathers rather than pigment. They are quite social birds and have a wide range of vocalizations, sometimes including ‘humanized’ sounds like car door alarms in their songs. There are many species ranging throughout the world from the Arctic to the Equator. The Starling family is closely related to Myna birds. Do you know how to tell the difference between a male and female budgie? It’s the colour of the “cere” which is the area above the beak that surrounds the nostrils. Boys have blue cere’s (of course! ), for females it is tan or brown while juveniles of both sexes will be purplish in colour. 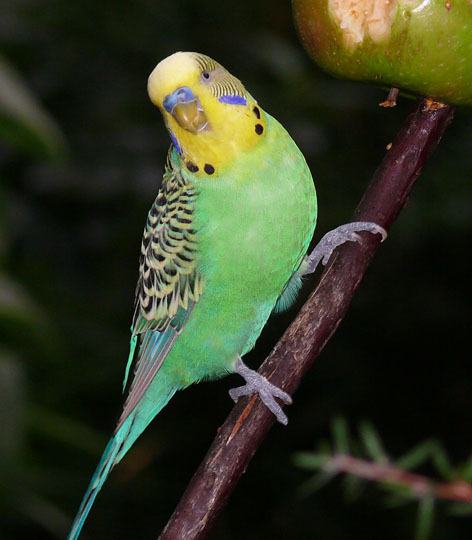 Budgies are native to Australia and have green plumage in the wild. Domestic birds range in colour from white, blue, yellow and green. A healthy budgie needs lots of room to fly so the Conservatory is a great home to the flock of residents who live here. Some people call budgies ‘parakeets’, but this is actually a ‘catch-all’ name used for many smaller species of parrots. 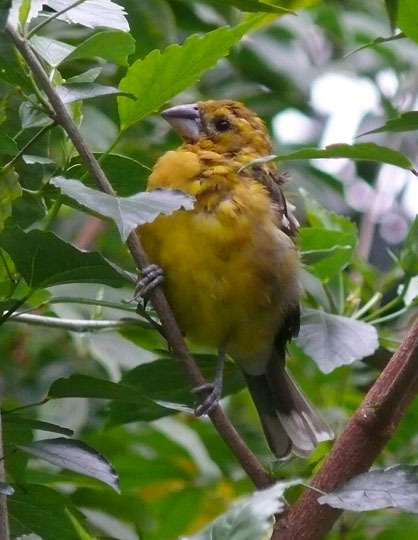 The Yellow Grosbeak is a medium-sized seed-eating bird in the same family as the Northern Cardinal. They are usually found on the Pacific side of Mexico from central Sonora to northwestern Oaxaca, and in southern Chiapas and Guatemala. The Grosbeak is a forest or woodland bird that can be found as far north as Arizona, California, New Mexico, and sometimes even Iowa, in the summer months. It is considerably bigger than its North American relatives, the Black-headed and Rose-breasted Grosbeak. 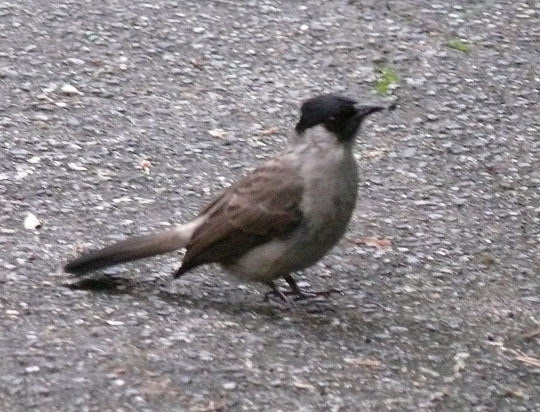 The Red-vented Bulbul is a member of the passerine family (meaning perching birds). It is native to India, Sri Lanka and China and was later introduced to the Hawaiian islands and Fiji. Bulbuls feed mainly on petals of flowers, nectar, insects, and fruits making it an important bird for distributing the seeds of plants. 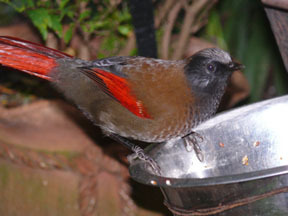 This Bulbul was given the name ‘red-vented’ because of the red triangular patch under it’s tail. They are quite good singers. 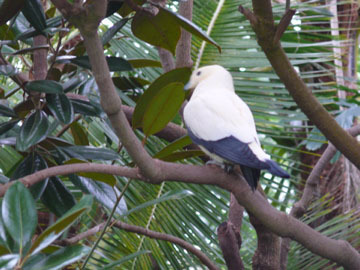 The Pied-Imperial Pigeon is also known as the Arboreal Dove, the Nutmeg, Torresian Imperial and Torres Strait Pigeon. In the wild, they are generally found in rainforests, eucalyptus woodlands, and along coastal scrubs, creeks, rivers, mangroves and islands. Did you know that pigeons are among the most intelligent and physically adept creatures in the animal kingdom? According to studies at the University of Montana, pigeons can recognize all 26 letters in the English language and differentiate different human beings in photographs. Because they can be taught to make complex responses in different sequences, they were utilized to save thousands of people lost at sea and during numerous rescue missions during times of World Wars I and II! The Touraco is one of the most exotic birds at Bloedel. 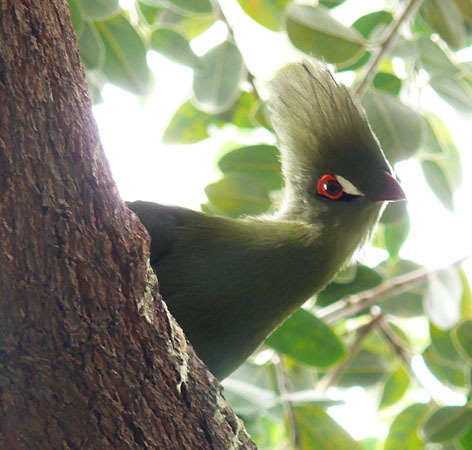 There are a number of different species of Touracos in the wild, this one is the Sierra Leone or Green-crested Touraco. He is elusive! If you can spot him you are lucky indeed! (Hint: he likes to hang out in the magnolia tree above the waterfall). Touracos are approximately 43 cm in length (nearly 12 inches) and are spectacular in flight. Princess Parrots originate from central and western Australia but today are rarely seen in the wild. 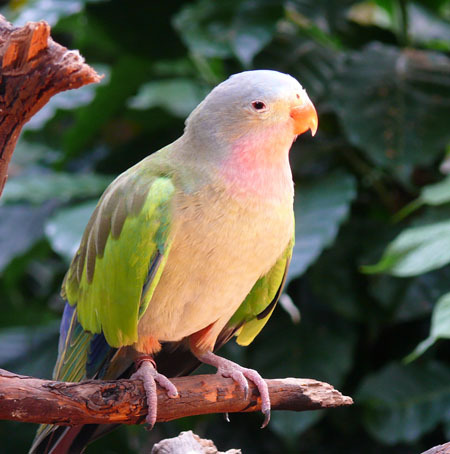 They are also known Splendor Parrots due to their pastel colouring. 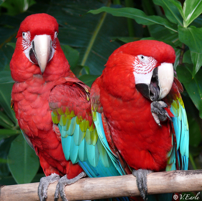 Princess Parrots are often described as very gentle and quiet with an endearing personality. If you look closely, they usually seem to be smiling. They are very social and tend to mimic whistles rather than talk. When Monty arrived at the Conservatory, he instantly fell in love with Casey the Amazon Parrot. She is never too far from his sight. When you find one, the other will be close by.